Maximilian Götz has arrived in the DTM. 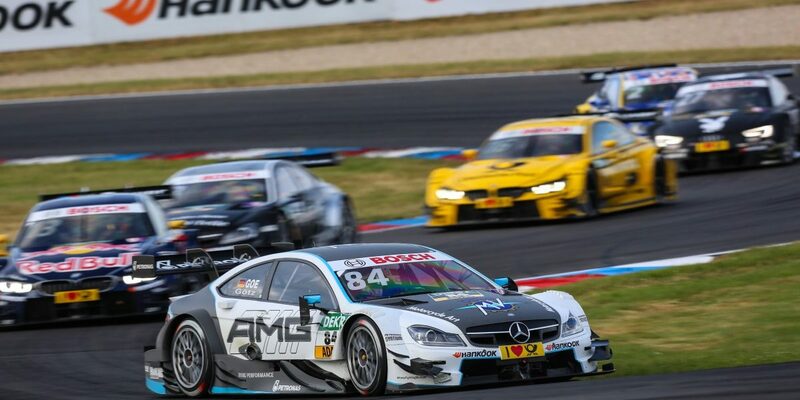 The Mercedes-AMG DTM driver took the next step in his career as a budding touring car ace during the second race weekend at the Lausitzring. In Saturday’s sprint race, Maximilian moved into 15th position after charging up the field from grid position 21. He finished 16th on Sunday in a hard-fought race lasting 60 minutes. Maximilian, what conclusions have you drawn from the second DTM race weekend? I’ve taken the chequered flag in all four races held so far and was best-placed rookie every time – that’s not bad. My two races here at the Lausitzring were decent. However, the results do not reflect what is possible or my goal either. I remain realistic but feel sure that I will soon secure my first points. I’ve shown that I can tackle the DTM too. Now I just need a little luck. If I can be in the right place at the right time, then I can move forwards. You waited a long time before coming in to switch tyres in the second race on Sunday. What was behind the strategy? Unfortunately, the car sustained damage in the warm-up and I couldn’t post a lap time in qualifying. For that reason, I had to start from the back row, but I had two sets of fresh sets of tyres and wanted to get the most out of them in the race. So, we waited quite a while before coming in. I stayed out on track for the longest time on the first stint. It wasn’t always easy to find enough traction. I had oversteer and had to really fight. Still, I’ve shown that I can defend myself well, which has also earned me respect. I drove my race and fought for position. Some opponents on fresher tyres tried to muscle me out of the way. Unfortunately, another car ran into my side, which spoilt my race. You moved up six places in Sunday’s sprint fixture to finish 15th. How would you rate that race? I didn’t get a good start, which was unfortunate. However, I was in the middle of the action and had good pace after the first turn. I overtook a few cars and was also able to use DRS to good advantage. Later, I got stuck behind my team-mate Paul Di Resta and two BMWs. I could perhaps have gone faster than the three guys in front of me, but I didn’t want to risk too much going up against Paul. There’s no point inflicting damage on one another. That’s why I kept my cool. I find that completing as many laps as possible and improving gradually help the most. It worked out really well in the end. Do you personally notice any progress compared to your DTM debut at the Hockenheimring? Yes, certainly. When I look at my lap times in the race, I’m just as fast as the more experienced guys at the top. A tremendous amount depends on qualifying in the DTM. It’s mega close! Drop a couple of tenths and you go straight to the back of the field. So I know that I have to continue to work on my qualifying performance. I still lack a bit of experience in the DTM as far as finding the right window for a hot lap is concerned. Data analysis helps me a great deal, and it feels like I’m steadily improving. The DTM is staging one of the high points of the year from June 26th-28th with the street circuit race in Nuremberg. How do you think you will fare? I’m hoping for an especially good result at the Norisring – it’s my home race. I live in Uffenheim, just a short drive from Nuremberg. Many of my friends and family will come to the race weekend to wish me luck. It’s a high point of the season, for sure! My last race at the Norisring was a while ago, back in 2008 in Formula 3, but the track has not changed much. I’ve finished on the podium there on a number of occasions during my time in single-seater racing, and our Mercedes-AMG DTM team has always been very strong at the Norisring in recent years, so I definitely think I’ve got a good chance.